Greetings Citizens of the World, We are Anonymous Ukraine. The Anonymous Hacktivist Collective worldwide is partially divided on the issue of Ukraine. This has to do with the western mass media propaganda and the... conflicting reports that are coming out of the country. This is sad as some Anons are unknowingly supporting the dark forces at work in Ukraine. Members of Anonymous Ukraine are aware of the internal meddling by the United States, NATO and the European Union into the internal sovereign affairs of Ukraine. Anonymous Ukraine supports peace and the right of the people to self determination. The Bandera Nazis and fascist thugs that are beating and killing police and members of the security services of Ukraine do not represent the will or the wishes of the people of Ukraine. The people of Ukraine do not want European Union integration. The people of Ukraine do not want NATO on their territory. The people of Ukraine voted for President Yanukovich to lead them in fair and just democratic elections. The people of Ukraine plea to the President and to Russia for help in stopping the siege of Ukraine by Nazi thugs and murderous gangs. The people of Ukraine do not want to see their beloved capital Kiev occupied by Nazi killers and burned to the ground. The people of Ukraine want their independence to be recognized and be allowed to determine their own fate without pressure from US, NATO, European Union. The people of Ukraine want peace and want the Bandera Nazis to be stopped once and for all. Anonymous Ukraine does not like nor support what is happening in Ukraine now. The so-called opposition is trying to tear Ukraine apart. 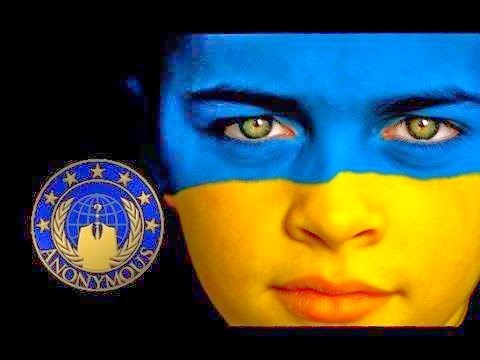 Anonymous Ukraine has released the e-mails of one of the leaders of the so called opposition and will continue to expose the moves by the west to subvert the sovereign country of Ukraine. The e-mails released by Anonymous prove that Vitaly Klichko is a puppet of the West and is being financed through intermediaries in Lithuania. The e mails also prove that Klitchko has bank accounts in Germany and is receiving funding for his coup d'état from the West. We will continue fighting these puppets. The western puppet opposition leaders will hurl Ukraine into chaos. We appeal to the president of our country. The people of Ukraine urge you. President Yanukovich, to restore order and bring calm and stability and disperse the gangs of robbers and Nazis. Anonymous Ukraine will strike at all of the web resources of western hirelings and fascists. Anonymous Ukraine calls for Ukraine to be unified and independent. The government of Ukraine promoted the country's integration into Euro-Atlantic institutions despite the reluctance of Ukrainian people. Ukrainian citizens realize that signing of the Association Agreement with the European Union will lead to the collapse of Ukrainian economy in the near future. We express our support to the people of our country. We want Ukrainian government and EU leadership to understand that people of Ukraine do not want their country to become a raw material donor to Europe. Ukraine must be free. We do not want to be dependent on other countries or organizations. Ukrainian people do not need a speculative Association Agreement with the European Union. Ukraine does not need to be a part of Russia-led Eurasian customs union. We do not need to be servants of NATO. Ukraine does not need European Union. Ukraine does not need NATO. Ukraine should not be anybody's servant.